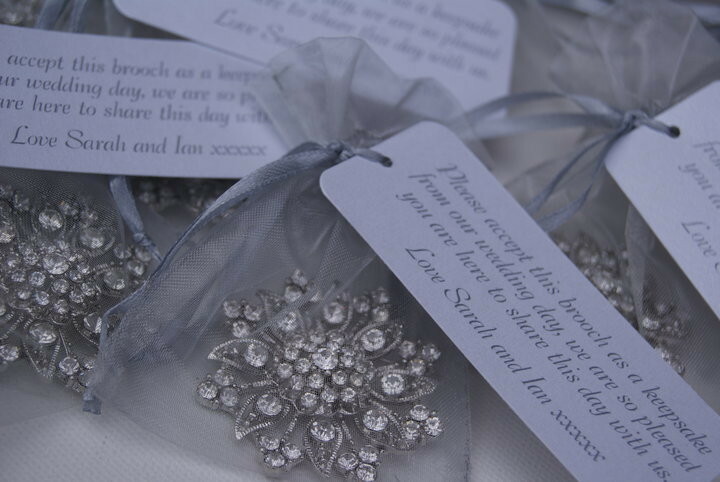 Some couples like to offer a small gift to each guest on their wedding day. Traditionally only ladies are given favours, however, these days men are normally included too. 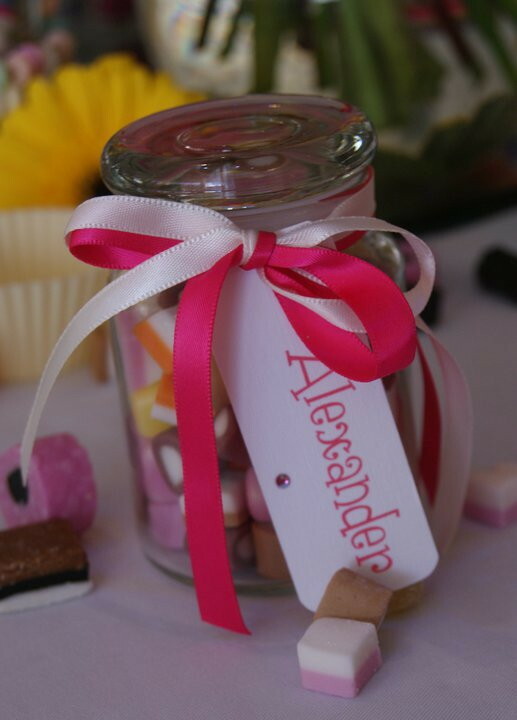 We have tons of ideas for favours and can buy lots of unusual gifts, should you need them. We are also happy to arrange beautiful packaging for gifts you may already bought. Please give us a call if you need some help with favours. We can buy these boxes in practically every colour! 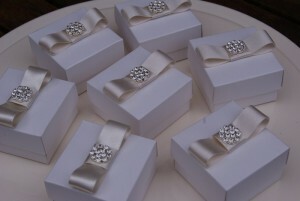 Shown here in ivory with ivory pearl ribbon, matching bow and a crystal embellishment named dainty. Fillings are available too, should you like us to source this on your behalf. These boxes are larger than "normal" favour boxes and are rigid . They are available in a small range of colours. 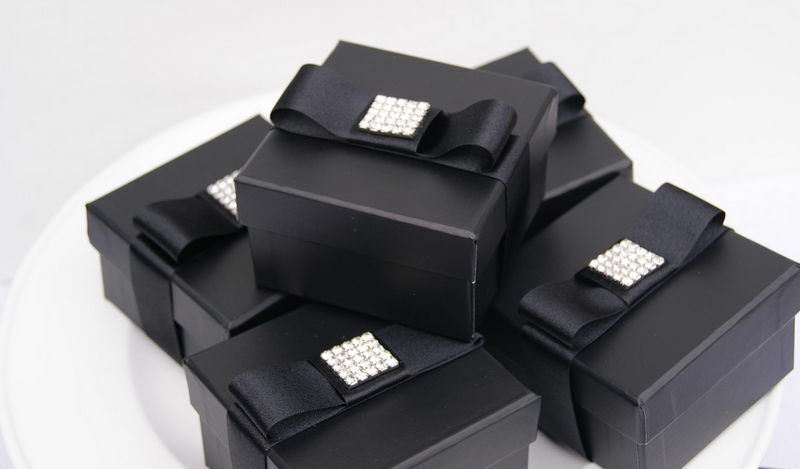 Shown here in black with a black ribbon wrap, formal bow and square crystal embellishment. We filled these with a crystal paper-weight. Very gorgeous! We love this phrase and its perfect for alcoholic favours...you provide the bottles and we will provide the tags ! We can buy these boxes in practically every colour! 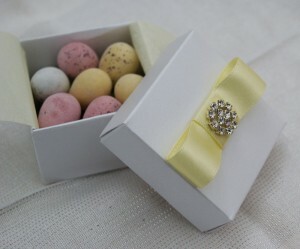 Shown here in pearly white with lemon ribbon, matching bow and a crystal embellishment named dainty. Fillings are available too, should you like us to source this on your behalf - these were for an Easter day wedding..perfect for chocolate eggs! 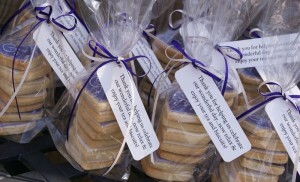 We do not make the biscuits (we have an Artisan baker that does) but we package them up and pop a label on them for you. 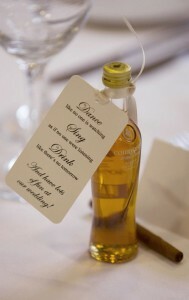 Thoughtful "Welcome" or "Thank you" gifts as well as Wedding favours and we print the label message accordingly. Shown here in heart shaped vanilla biscuits, iced with flowers, hearts and the couples initials all packaged with a matching coloured ribbons.